The Ceremonial Second Cup Of Wine/The Simcha - This 2nd cup of wine was shared during the marriage ceremony with the bride drinking after the groom, thus the ketubah has been completed (the first cup of wine having been drank at the acceptance of the ketubah). 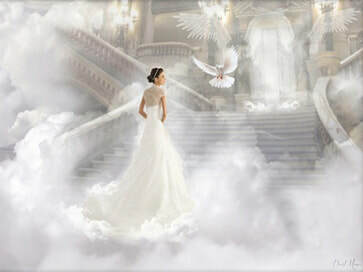 As for the pre tribulation wedding view of "a heavenly week long wedding event," meaning everyone is in heaven for 7 years at a marriage banquet, as I have heard many pre tribulationists declare or suggest. To me, first of all, it seems like a wishful stretch to try to make the rapture happen at the beginning of the seven years. Secondly, nothing is written in the Bible about the Lord and His bride having week long (seven years equaling seven days) marriage banquet, or a marriage event starting with a banquet, then a week long (one day = a year) honeymoon followed by another banquet. The Bible shows that there is only one wedding supper of the Lamb and it is followed by the battle at Armageddon and the Second Coming (Revelation 19:6-21, 20:1-6).